To install with Fedora 21, install these dependencies from Edward Borasky’s Tarbell docker image (untested). 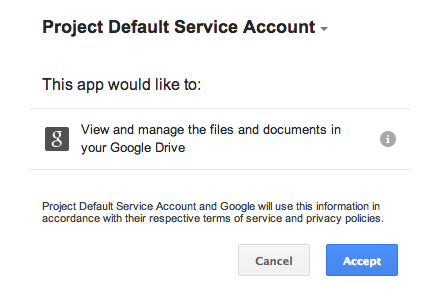 Please consider setting up Google spreadsheet access for collaborative data editing and Amazon S3 settings for easy publishing. 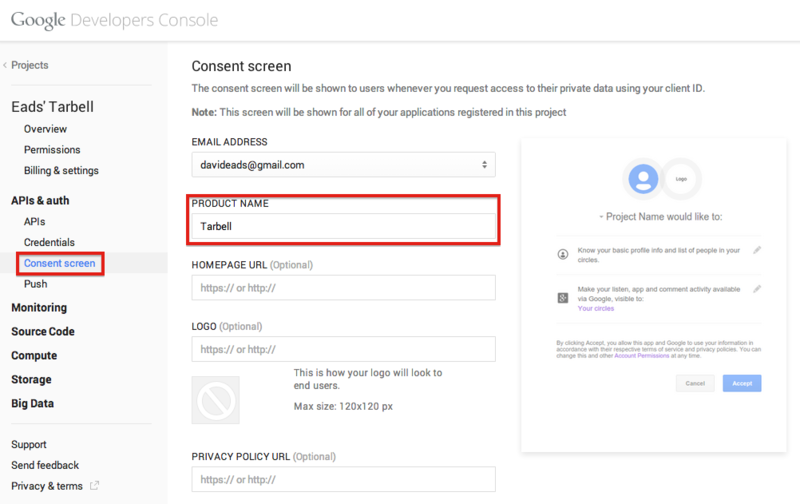 In order to allow Tarbell to create new Google Spreadsheets, you’ll need to download a client_secrets.json file to access the Google Drive API. You can share this file with collaborators and within your organization, but do not share this file anywhere public. 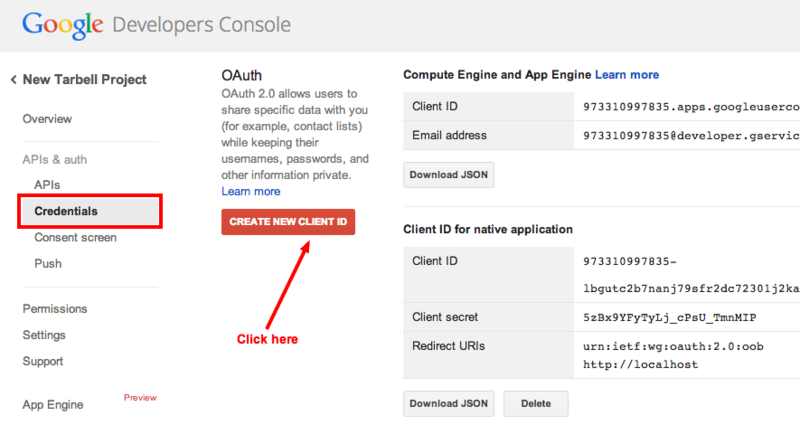 Now click the “APIs & auth” tab. 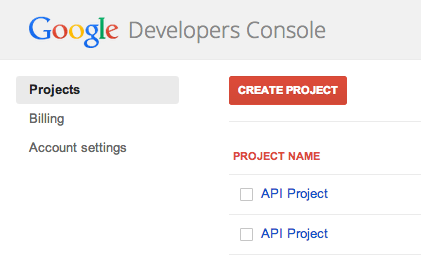 (Click on the “APIs” tab below that if it doesn’t open automatically.) 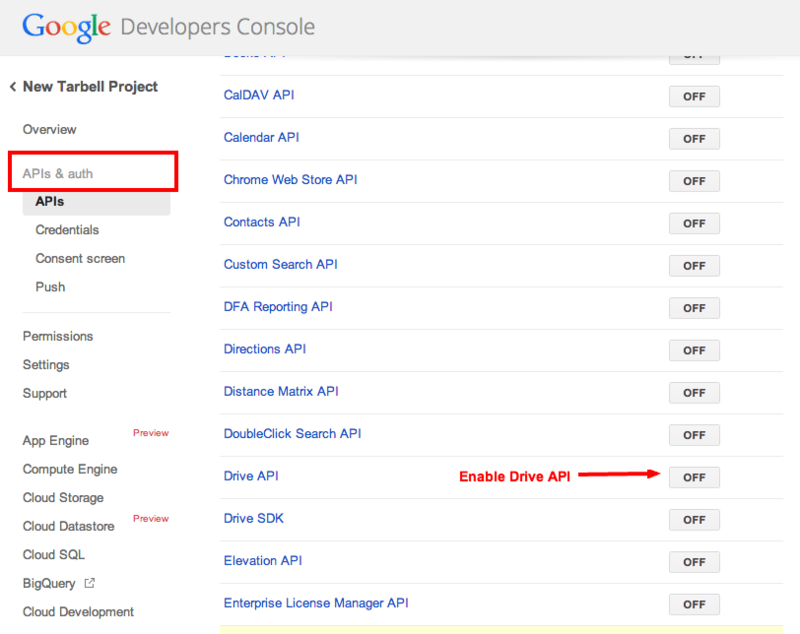 Enable Google Drive API. The file you download will be called something like client_secret_longstringofrandomlettersandnumbers.apps.googleusercontent.json. Rename it to client_secrets.json . Now you can access and create Google spreadsheets to use with Tarbell projects. You need to visit the authentication page from the same machine that you are configuring Tarbell in order to avoid an OAuth Error. If you are using a remote machine, consider using the Lynx terminal browser. Alternatively, you can pre-authenticate <remote-configuration.rst> . 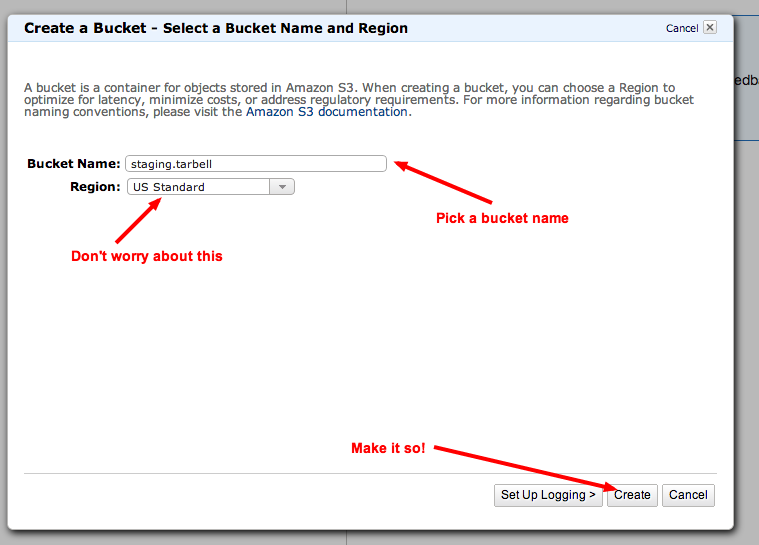 Generate keys for your Amazon S3 account. Add them during the Amazon S3 section of installation. 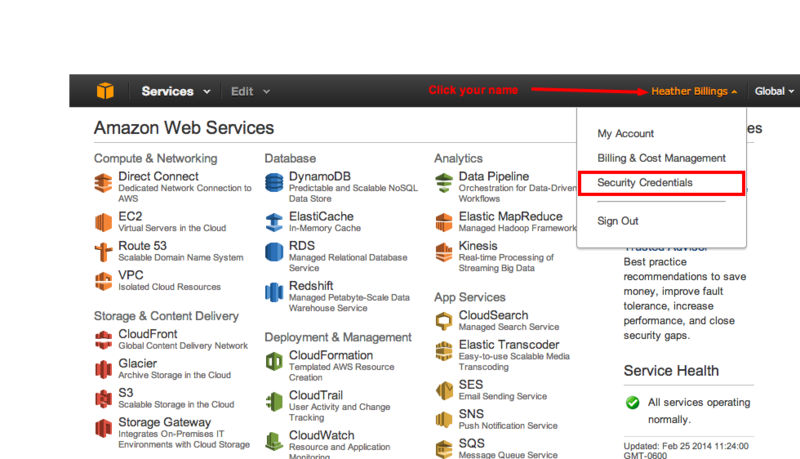 To generate keys, log into your AWS Console, click your name and select “Security Credentials”. Don’t worry about IAM users right now. You should see a list of different sections. 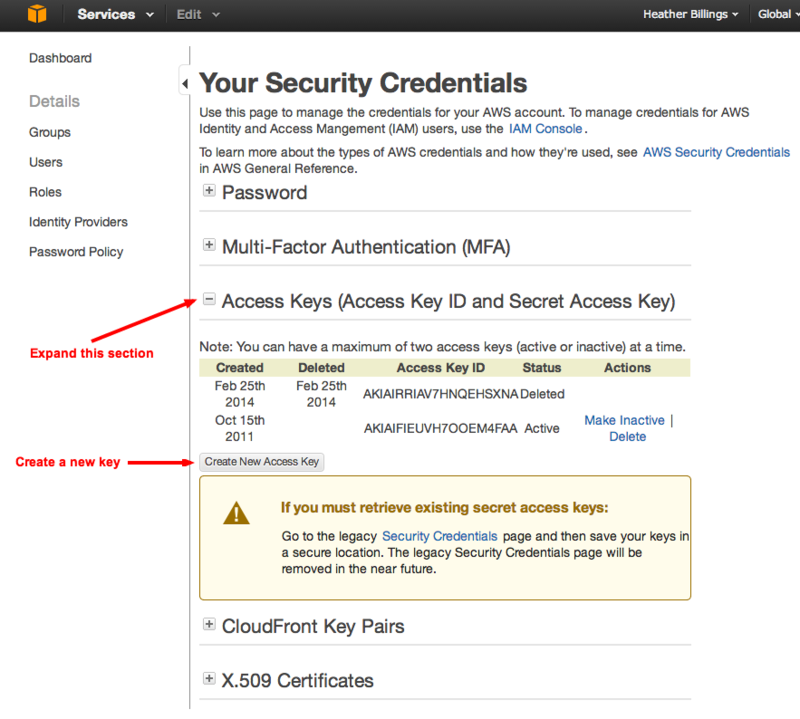 Click the section that reads, “Access Keys (Access Key ID and Secret Access Key)” and then the button, “Create New Access Key.” Note that if you have existing keys, you can currently retrieve its Access Key ID and Secret Access Key from the legacy Security Credentials page (linked to in this section), but that Amazon plans to remove the ability to see this information soon. Woohoo, now you can download your keys! You MUST do this now – Amazon only lets you download the keys on this screen. If you accidentally close the prompt, you can always delete the keys you just generated and generate a new pair. If there are additional buckets in your S3 account that you want to use with Tarbell, enter their names here. Otherwise, skip this. This is where your Tarbell projects will live. This path will be used by tarbell list and tarbell switch . If you’ve never heard of virtualenvs or know you’re not using one with Tarbell, skip this section. Virtual environments (virtualenv) are useful for developers and advanced users managing many Python packages. Tarbell can be installed globally or within a virtualenv. If you’ll be working on Tarbell itself, extending its functionality or otherwise manipulating the guts of the system, then it might make sense to install it inside a virtualenv. 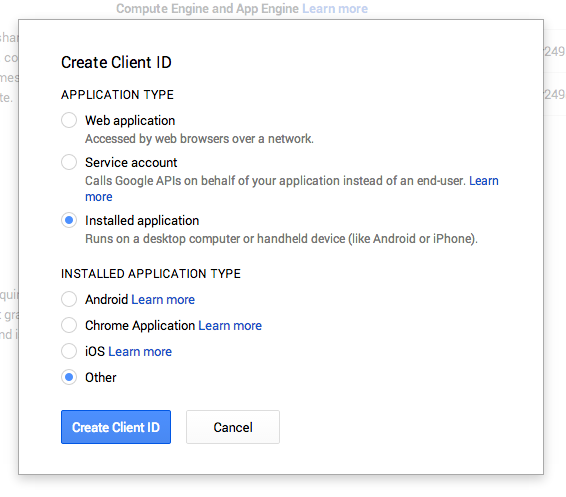 The client_secrets.json file used to authenticate to Google is also global, so you may run into problems using multiple Google accounts to access spreadsheets.